On a sunny but chilly spring day, the East Canyon Echo Road Racetook place in Henefer, Utah on April 16, 2016. 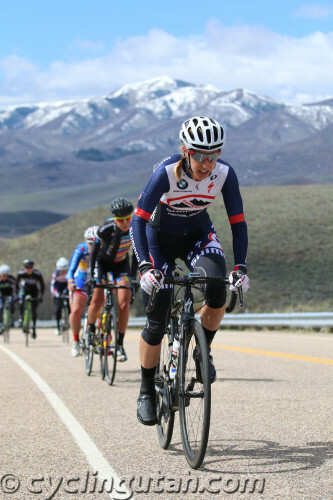 Promoted by James Zwick of Sports-Am, the race is one of Utah’s classic road events. The race starts with a 5 mile climb from Henefer to the top of Hogsback, with a descent to East Canyon Resorts, back up the stair-step climb to Hogsback and out to the Echo Canyon and back to Hogsback for the finish. Close to 200 racers including Colorado’s Fort Lewis College Skyhawks lined up for the 60-mile road race (14 for Juniors, and 40 for Women 3/4 and Women Masters). In the women’s race, Mindy McCutcheon (Canyon Bicycles – Shimano) showed her strength by leading up the return climb from East Canyon Resorts. The women’s field was largely intact at the top of Hogsback. From the turnaround and through through Henefer again for the third ascent to the Summit-Morgan County Line, the field was down to Breanne Nalder (Visit Dallas/DNA Cycling), Mary Emerson (TOSH Hyperthreads), McCutcheon, Jenna McPherson (Fort Lewis) and a bridging Anne Perry (Canyon Bicycles Shimano). Nalder pulled for most of the climb with McCutcheon in tow. With McCutcheon’s teammate Anne Perry not far off the pace, she had the luxury of sitting on. When it came to the final kilometer, it was all McCutcheon for the win. Nalder came in second with Perry a bit back in third. Emerson was fourth, and Fort Lewis College’s Jenna McPherson in fifth. “I kind of made her work then managed to just drop her in the last 1k. She’s probably not too happy I sat on her wheel for the last four miles. But hey, that’s bike racing,” said a happy McCutcheon. McCutcheon and Nalder are both off to New Mexico’s Tour of the Gila in early May. In the Men’s pro race, Canyon Bicycles Shimano controlled the race throughout. 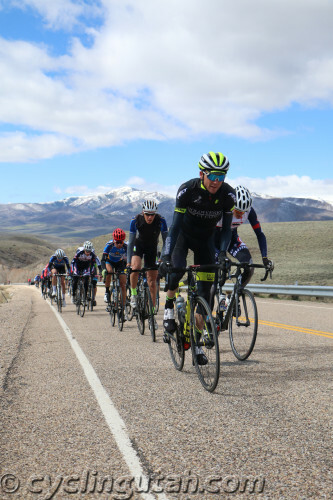 Impressive, given the presence of one of Utah’s best pro road racers, Robbie Squire (Holowesko Citadel Racing Team pb Hincapie Racing), as well as the super strong Fort Lewis College Skyhawks Team. Canyon sent Michael Wilcox off early, and continued to launch attacks throughout. On the second time to the summit of Hogsback, Cortlan Brown and Mitchell Peterson (Canyon Bicycles-Shimano), and Rob Squire had a slight gap. This didn't last however. Erik Slack and Kaler Marshall (both Canyon riders) attacked on the downhill into Henefer. That didn't last either. Eventually, a break of 6 or so riders formed. 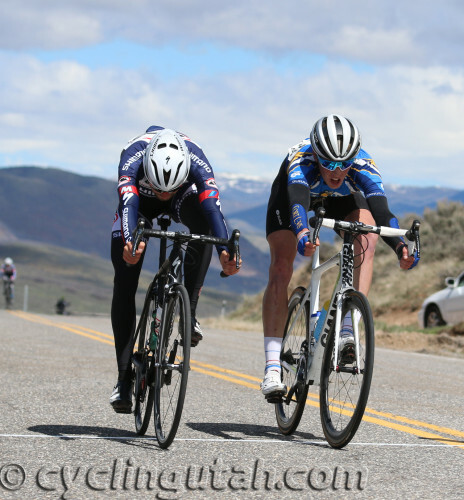 With Canyon rider Joe Waters in the break at the Echo turnaround, it was up to Fort Lewis to chase, which they did admirably, bringing young gun Cormac McGeough up to the break. “There was brutal headwind up along the Interstate until the turnaround. The team got to it, started rotating just doing excellent work. Like textbook from Team Sky kind of business. I was just hanging out, watching them, shedding tears, it was just beautiful,” said McGeough. As the chase got closer to the break, several riders made it across including McGeough, Slack, and Peterson. The Fort Lewis rider more than held his own on the finishing climb despite being outnumbered 3-1 by the local powerhouse Canyon Bicycles Shimano squad. He attacked the break several times. Peterson closed the gap, bringing Slack along with him. Eventually, Brown bridged to the group of three, and immediately attacked them. Slack and McGeough jumped on, dropping Peterson. In the Master’s 45+ Cicada Racing’s Christophe Heinrich and Duane Allgier rode together for an hour and half, but were caught by a group of 3. On the final climb, Heinrich again attacked half way up the climb to solo in for the win.